Multiple CEOs and 2 actresses were charged in a federal indictment. Yale University has rescinded the admission of a student that officials at the school say was involved in an alleged nationwide college entrance scam that ensnared 50 people, including Hollywood actresses and chief executive officers, some of whom appeared Monday in a Boston federal courtroom. The ousted student, who was not identified, is the second person from the Ivy League college caught up in the coast-to-coast scandal in which federal prosecutors allege dozens of wealthy parents lied and paid massive bribes to get their children into elite schools. Rudolph "Rudy" Meredith, the former head women's soccer coach at Yale, was arrested in the federal probe dubbed "Varsity Blues," and charged with conspiracy to commit wire fraud and honest services wire fraud. Prosecutors said Meredith, 51, was paid a $400,000 bribe by William "Rick" Singer, identified by authorities as the ringleader of the scam, to accept a student even though the applicant did not play soccer. 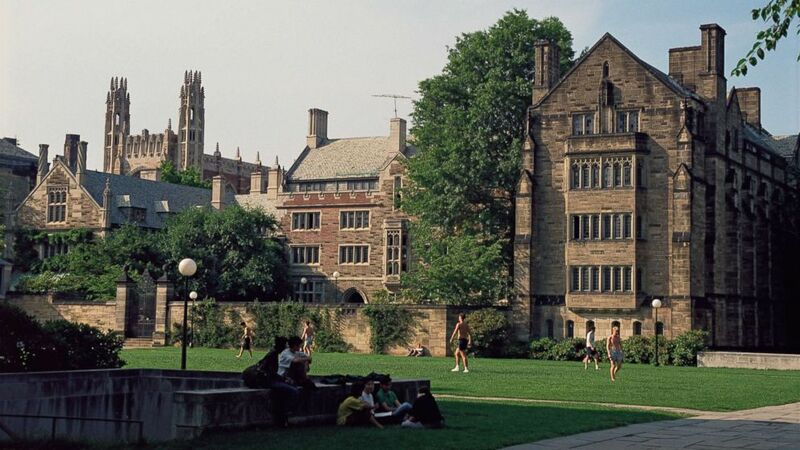 (STOCK PHOTO/Getty Images) An undated photo of Yale University. The Yale student's parents had allegedly paid Singer $1.2 million to get their daughter into the prestigious Connecticut school, prosecutors said. "Yale has rescinded the admission of one student as a result of this matter," Yale spokesman Thomas Conroy said in a statement to ABC News. Meredith, who prosecutors said had been working with Singer since April 2015, resigned as coach in November after 24 seasons. At the time he said "it is time to explore new possibilities and begin a different chapter in my life." The Wall Street Journal reported that Morrie Tobin, a Los Angeles financial executive, had sought leniency in an unrelated securities fraud case against him by tipping off federal investigators that Meredith had sought a bribe from him in return for getting Tobin's daughter into the Yale. Tobin's tip, according to The Journal, led investigators to uncover the widespread cheating scandal involving dozens of wealthy parents. Conroy told the Yale Daily News, the college's independent student newspaper, that school officials have launched an internal review with the assistance of outside counsel to determine if there are other students involved in the scam. (Brian Snyder/Reuters) William "Rick" Singer leaves the federal courthouse after facing charges in a nationwide college admissions cheating scheme in Boston, March 12, 2019. The first batch of defendants charged in the scam appeared in a Boston federal courtroom on Monday. The 12 defendants all pleaded not guilty to charges of racketeering conspiracy. They were ordered to surrender their passports. The hearing was the first in a series of hearings scheduled in Boston federal court for those charged. Parents indicted in the investigation allegedly paid bribes of up to $6.5 million to get their children into some of the nation's top colleges, including Stanford, Georgetown and the University of Southern California, federal prosecutors said. Federal prosecutors allege that Singer bought off numerous coaches, college entrance exam administrators, one exam proctor, and a college administrator to help him in his years-long scheme to academically benefit the children of wealthy families. Singer has pleaded guilty in a Boston federal court to charges of racketeering conspiracy, money laundering conspiracy, conspiracy to defraud the United States and obstruction of justice. Among the 33 parents indicted are Academy Award-nominated actress Felicity Huffman and actress Lori Loughlin, best known for her character Aunt Becky in the ABC sitcom "Full House." Loughlin's husband, the fashion designer, Mossimo Giannulli, was also charged in scam. Tens of thousands of dollars in bribes allegedly went to a sham charity Singer set up called the Key Worldwide Foundation. Singer, according to prosecutors, would funnel the money to those working in cahoots with him, including coaches who listed college applicants as recruited competitive athletes despite some of them never having played sports, according to prosecutors. At least seven of the nine coaches charged in the scam made court appearances Monday in Boston. Meredith is expected to enter a plea at a later date, while John Vandemoer, the former sailing coach at Stanford University, has already pleaded guilty to racketeering conspiracy. Pleading not guilty Monday before a judge in Boston were legendary USC water polo coach Jovan Vavic, who has been fired by the school; Laura Janke, the former USC women's soccer coach; former Georgetown University tennis coach Gorden Ernst; former UCLA men's head soccer coach Jorge Salcedo; Wake Forest head volleyball coach William Ferguson, who has been placed on administrative leave; and former USC women's head soccer coach Ali Khosroshahin. Martin Fox, president of a Houston-area tennis academy also pleaded not guilty. Fox, who is also involved in guiding student basketball players to college, allegedly accepted at least $250,000 in bribes to help Singer with both athlete recruitment and test-taking fraud, prosecutors said. Donna Heinel, the former senior associate athletic director at USC, pleaded not guilty to racketeering conspiracy on Monday and her attorney said she is looking "forward to reviewing the government's evidence and fullying restoring Donna's reputation in the college athletic community." "These charges come as a complete shock," Heinel's attorney, Nina Marino, said in a statement. "Anyone who knows Donna Heinel knows she's a woman of integrity and ethics with a strong moral compus." The nationwide scheme was prosecuted in Boston partly because it was uncovered by FBI agents working there on an unrelated case, officials said. Some members of Singer's inner circle also appeared before a federal judge in Boston, including his bookkeeper Steven Masera. Mikaela Sanford, who was also employed by Singer, allegedly took online classes for certain students and is accused of "secretly taking" art history and biology classes so that the daughter of Robert Zangrillo, founder and CEO of Dragon Global, a Florida-based private investment firm, could get into USC, according to the federal indictment. Igor Dvorskiy and Niki Williams, who both served as a college entrance test administrators, appeared in court Monday and pleaded not guilty to charges they both allowed Mark Riddell, a private school counselor in Florida, to take entrance exams for students or correct them on the sly, according to the indictment. 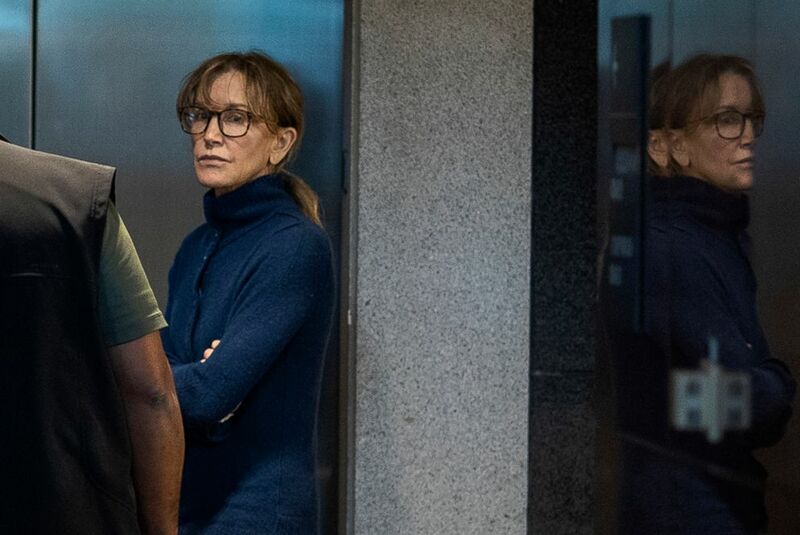 (David Mcnew/AFP/Getty Images) Actress Felicity Huffman is seen inside the Edward R. Roybal Federal Building and U.S. Courthouse in Los Angeles, March 12, 2019. Riddell, 36, who is charged with two criminal charges of conspiracy to commit mail fraud, has apologized for his involvement in the scam. "I want to communicate to everyone that I am profoundly sorry for the damage I have done and grief I have caused those as a result of my needless actions. I understand how my actions contributed to a loss of trust in the college admissions process," Riddell, who is scheduled to appear in Boston federal court in April, said in a statement earlier this month. "I assume full responsibility for what I have done." Loughlin and Giannulli have been ordered to appear in federal court in Boston in April. They are charged with allegedly paying Singer a bribe of $500,000 "in exchange for having their two daughters designated as recruits to the USC crew team -- despite the fact that they did not participate in crew -- thereby facilitating their admission to USC," according the indictment. Loughlin's two daughters, including Olivia Jade Giannuli, a popular YouTube vlogger with more than 2 million online followers, are among numerous students under investigation at USC and could face discipline, including being removed and banned from the school, officials said. Huffman's husband, actor William H. Macy, was not indicted, but according to court documents he and Huffman were caught on a recorded conversation with a corroborating witness in the case, allegedly discussing a $15,000 payment to ensure their younger daughter scored high on a college entrance exam. Huffman was indicted on charges stemming from the $15,000 she allegedly disguised as a charitable donation so her older daughter could take part in the college entrance cheating scam, the indictment reads. But Huffman and Macy apparently decided not to go through with scheme for their younger daughter. 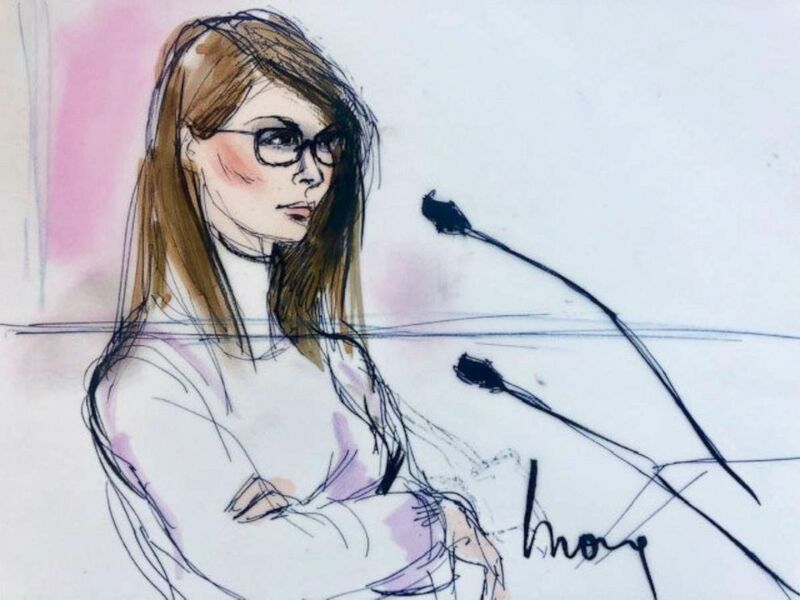 (Mona Shafer Edwards/Reuters) Lori Loughlin appears in this court sketch at a hearing for a racketeering case involving the allegedly fraudulent admission of children to elite universities, at the U.S. federal courthouse in downtown Los Angeles, March 13, 2019. Huffman is scheduled to appear in Boston federal court on Friday. Singer, owner of a college counseling service called Edge College & Career Network, allegedly accepted bribes totaling $25 million from parents between 2011 and 2018 to guarantee their children's admission to elite schools, according to the indictment. "This case is about the widening corruption of elite college admissions through the steady application of wealth combined with fraud," Andrew Lelling, the U.S. attorney for the District of Massachusetts, said at a news conference on March 13. "There can be no separate college admissions system for the wealthy and, I'll add, there will not be a separate criminal justice system either." Editor's Note: A previous version of this story incorrectly identified Donna Heinel's attorney.